Medication management can become such a struggle for so many elderly adults today, especially those who don’t have a senior caregiver who takes on this responsibility. Whether seniors choose to manage their own medication, or they just don’t have someone to do it for them, the right pill organizer can be key to any senior’s success. 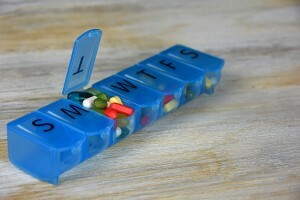 While it may seem like a rather simple device, a pill organizer can be the one thing that prevents seniors from having medication mix ups, whether that means taking the wrong pills, taking too many pills or taking not enough pills, issues with medication management are very serious in elderly adults. A majority of senior hospitalizations today are either from falls caused by medication side effects, or from issues related to poor medication management. With a majority of senior citizens taking three or more prescription drugs today, pill organizers are a great tool to help elderly adults stay organized. Plus, today’s modern pill organizers typically not only have sections for each individual day, but for the time of day as well, ensuring that seniors will always take the right pills at the right time. Consider an organizer with a pop-up lid if your loved one has arthritis. Look at the size of the compartments and think about how many pills your loved one will need to put in each compartment. If they are too small, it can make loading and unloading difficult. Consider whether you need a daily pill organizer or a multi-day organizer. Find a pill organizer that is clearly labeled with bold, contrasting colors so that your loved one can read the labels with ease. Don’t try to make the system too complex, the easier the better for seniors. There are some pill organizers that even offer auditory cues if your loved one has vision issues. This can include features such as timers that remind seniors it is time to take their medication. Find something that is big enough for your loved one to notice, but if they travel often, you may want to consider a separate travel pill organizer. Medication mishaps are very serious issues in the senior community. However, many times they are preventable, especially in seniors. Proper medication management with a pill organizer is about more than just buying something to make a senior’s life easier, it is a major health and safety concern. When seniors don’t take their medication properly, it can lead to serious side effects, health issues, hospitalizations, falls or even death. Take the time to find a pill organizer that works for your loved one, it can make all of the difference in the world in their health, safety and quality of life.